By combining the light of three powerful infrared telescopes, an international research team has observed the active accretion phase of a supermassive black hole in the center of a galaxy tens of millions of light years away, yielding an unprecedented amount of data for such observations. 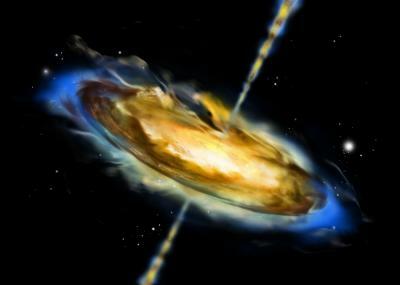 The resolution at which they were able to observe this highly luminescent active galactic nucleus (AGN) has given them direct confirmation of how mass accretes onto black holes in centers of galaxies. “This three-telescope interferometry is a major milestone toward directly imaging the growth phase of supermassive black holes,” said Sebastian Hoenig, a postdoctoral researcher at the UC Santa Barbara Department of Physics. They found that a ring of hot dust that marks the transition from a more-distant mixture of gas and dust in a toroidal (doughnut-shaped) structure to a gaseous disk closer to the black hole. The dusty part is interesting because it dominates the infrared emission of active galactic nuclei and can be easily observed, said Gerd Weigelt, a director of the Max Planck Institute for Radio Astronomy. By using the AMBER interferometry instrument to simultaneously combine the light from three 8-meter telescopes at the Very Large Telescope Interferometer (VLTI) at the Paranal Observatory in Chile, the research team was able to achieve the angular resolution needed to observe the hot dust ring. The Paranal Observatory is operated by the European Southern Observatories (ESO). To achieve the needed angular resolution in a single telescope, it would have to be 130 meters in diameter. The combination of the light from the three telescopes was no small feat, as the tiny differences in the arrival of light in the individual telescopes have to undergo constant correction with an accuracy of a few microns.